You can listen to this episode above and subscribe to our podcast on iTunes. You can also listen to this episode on Stitcher, Cyber Ears or download it on Archive.org (59mins, 26MB). 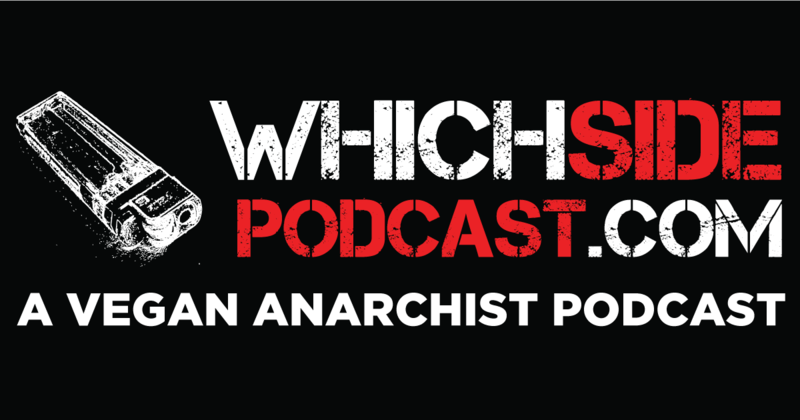 Nick is joined by Jordan Halliday and Jeremy Parkin from Which Side Vegan Anarchist podcast for almost the entire episode. We discuss: Jordan’s time in prison, the importance of prisoner support, anarchism and voting, the dietary focus of the way veganism is promoted by many animal organisations, scepticism and rationality, self-righteous health vegans, Mormonism and atheism. We encourage you to listen to Nick on Which Side podcast and check out their other episodes too! Tom Morello – The Nightwatchman ‘Which Side Are You On?’, Mad as Hell ‘Series 5, Episode 4’, Jamie Kilstein ‘Sober Vegan Party Time’ from the album ‘What Alive People Do’, Sue-Anne Post ‘Twenty Years of Kicking God in the Shins’ – from the 2010 Atheist Convention, Book of Mormon ‘All American Prophet’. You can listen to a short (10 minute) version of this episode, which features Jeremy and Jordan on the importance of prisoner support, below. You can subscribe to these short versions of our episodes through Omny.